Let's skip the (mildly) dramatic build up and reveal. After all, the title completely gives my opinion away. This year, Oreo released festive Valentine's Day cookies with lots of great gimmicks, and a vague flavor description, "Sweet and Tangy." Thanks, Oreo. I hate it. even after eating several of these cookies, I am not entirely sure what they were aiming for. I just know that I hate it. 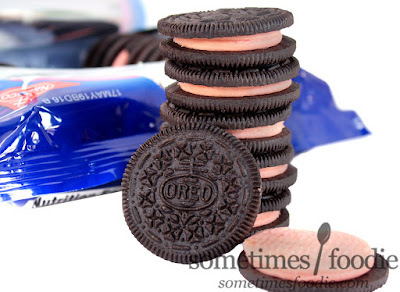 Before I get into talking about how these fail so hard at tasting good, let's point out a few things Oreo did right. 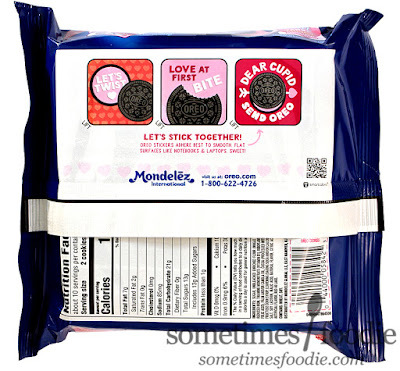 Visually, the packaging and cookies show a lot of attention to detail. 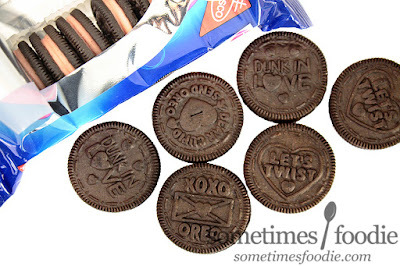 The packaging acts as a love letter (or gift) from Oreo to you, the consumer, and they even included 4 different cheesy messages on their cookies and fun stickers on the back of the packaging. This messages in particular lean towards Conversation Heart Territory, but when you open the packaging the smell is all wrong. I was NOT ready for this aroma. I smell hints of lemon, chocolate, and a musky sour aroma. It's a little reminiscent of sour sanding sugar you'd find on Sour Patch Kids, but there is a muskiness that you cannot shake which, unfortunately, smells like cat pee. I really hesitated to write that, because it is something I have never said about any food item before, but these really do smell like sugar, chocolate, lemons and cat pee. How did these ever make it to production?! I tried the cream on it's own, and while I can safely say it tastes better than it smells, it's still not great. The creme filling feels a bit lighter than usual with a gritty sugary texture, but the tiny crunchy granules aren't like normal sugar, it reminds me of the light, fake-snow-like, Stevia stuff my boyfriend used when he went Keto. It is tangy, and a little sweet, so it delivers what it promised, but it just does NOT taste good and I still cannot pin-point this flavor. To me, this does NOT taste like chalky classic Conversation Hearts, and it's not Sweet-Tart-like either. 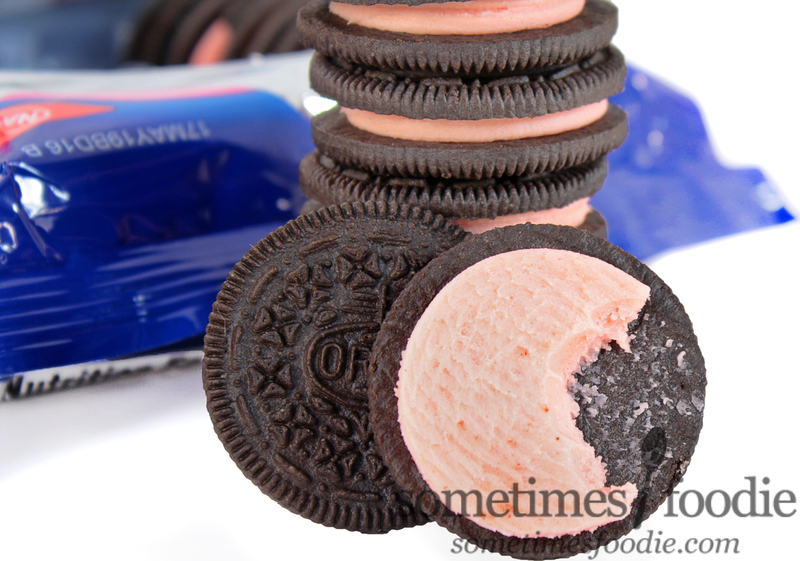 What are these pink-tinged abominations? When eaten together with the chocolate cookie, the filling's more horrible aspects are dulled down and it is a much more enjoyable experience. It gives me flashbacks to the chocolate lemon Oreos that were out a while back. 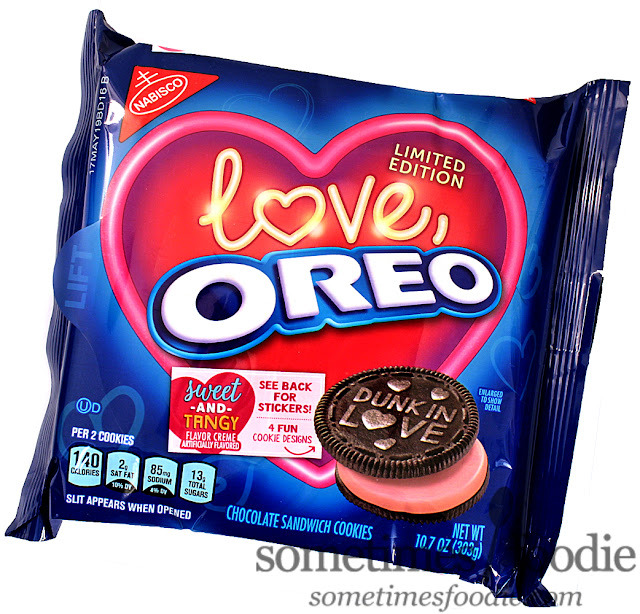 Honestly, it's not the worst Oreo I've ever tried, but I can't say I'd recommend buying these, even if you can get them on post-Valentine's clearance racks. The scent is a major turn off and the tanginess is more novelty than palatable, but hey! Free stickers! They tasted grapefruitish to me, honestly. So gross.